» Trees Illegally Chopped Down on 405 Freeway: Was It For Visibility of Billboards and Shopping Mall Signs? Trees Illegally Chopped Down on 405 Freeway: Was It For Visibility of Billboards and Shopping Mall Signs? 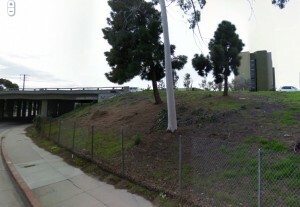 Several weeks ago, the California Highway Patrol caught a person cutting trees in the 405 Freeway right-of-way adjacent to the new Westfield shopping mall in Culver City. 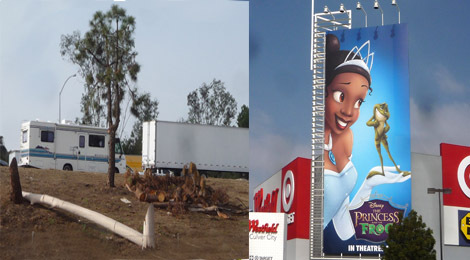 The above photo shows the remains of two of those trees, which stood in the line of sight of the billboard affixed to a corner of the shopping mall, advertising a yet-to-be-released Disney movie. According to the California Department of Transportation, this blatantly illegal act is currently under investigation, along with six other tree-cutting incidents that may involve the issue of billboard or supergraphic sign visibility from L.A. area freeways. Outraged By the Cutting of Trees on Public Property to Enhance Billboard Visibility? Who Cares About Trees Cut For Billboard Visibility?